Image caption Fidel Castro said Mr Obama's words of reconciliation were "syrupy"
Fidel Castro has broken his silence over President Obama's Cuba visit in a damning letter published in state-run newspaper Granma. 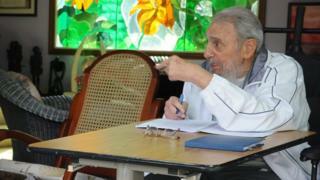 Fidel, who handed power to his brother Raul a decade ago, said Cuba did not need any gifts from the "empire". He described Mr Obama's words of reconciliation as "syrupy" and warned they could give Cubans a heart attack. Mr Obama had suggested that it was time to bury the last remnant of the Cold War in the Americas. In his 1,500-word letter, Fidel Castro also reminded readers of the Bay of Pigs invasion of 1961, in which a CIA-sponsored paramilitary force of Cuban exiles attempted to take over the island. However, the 89-year-old ex-leader also said his "modest suggestion" was that Mr Obama "reflects and doesn't try to develop theories about Cuban politics". During his visit, Mr Obama invoked "a future of hope" for Cuba in an unprecedented live TV address delivered from the Grand Theatre in Havana. He told President Raul Castro that he did not need to fear a threat from the US nor from "the voice of the Cuban people". He also called for the lifting of the 54-year old US trade embargo against Cuba, a remark which was met by loud applause. The embargo remains one of the main sticking points in US-Cuban relations but can only be lifted by the US Congress. Mr Obama's visit to Cuba was the first by a president since the Communist revolution in 1959. Media captionYoung Cubans: "We don't want a lot of McDonalds and Starbucks"
Explosions have been reported at churches and hotels in Sri Lanka as Christians celebrate Easter.